I had an interesting support request recently where a customer asked if there was a way to archive a particular user’s mail folders in slightly different ways to all the other users. In their scenario they had a user (we’ll call him Fred for the purpose of this post) who had a ‘project’ mail folder that they didn’t want any historic removing from during the archiving process. 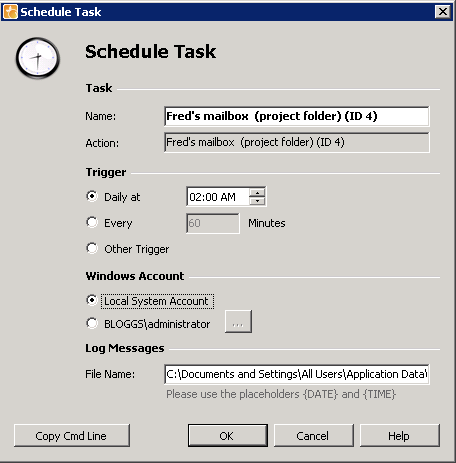 The concern was that if the option to delete all old email from user’s mailboxes older than a certain age was enabled, important messages in Fred’s ‘Project’ folder would also be removed. This isn’t usually an issue as users can always search in MailStore to pull those messages back, but Fred wants a folder in Outlook that’s always visible. Because the company’s server was quite overloaded with the volume of messages in mailboxes, they still wanted to reduce the mail retention period across the company down to one year using MailStore but not messages in Fred’s ‘projects’ folder. At first glance there’s no obvious option to do this in MailStore, however by utilising the inclusions and exclusions feature and setting up some additional single user mailbox archiving jobs I managed to give them a solution they were very happy with. 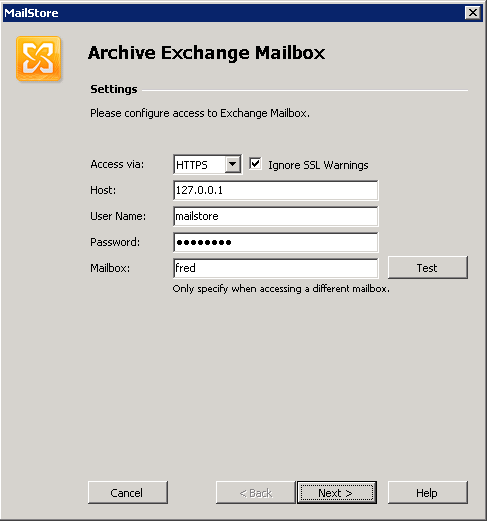 As with most typical MailStore installations, all the user’s mailboxes are being archived as part of an Exchange multi-user mailbox job. 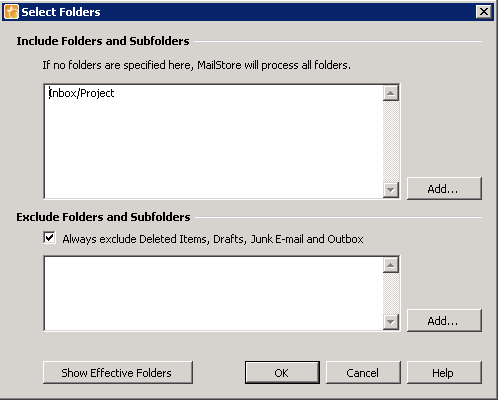 As the name suggests, this job archives several user’s mailboxes along with the corresponding folder structure. Making any changes to the folder exclusions within this job will affect all users. The only time you can get away with applying exclusions here is if the user has a unique folder name to exclude. In our example the folder was names ‘Projects’ so it was best to deal with fred’s mailbox independently. 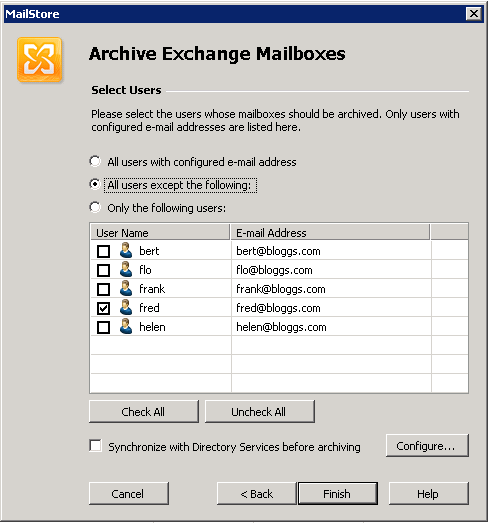 Edit the multiple mailboxes job and under the ‘Archive Exchange Mailboxes’ section select the option ‘All users except the following’ and deselect the specific user ‘Fred’. For this job we will authenticate as the ‘MailStore’ account, and select Fred’s mailbox to work with. 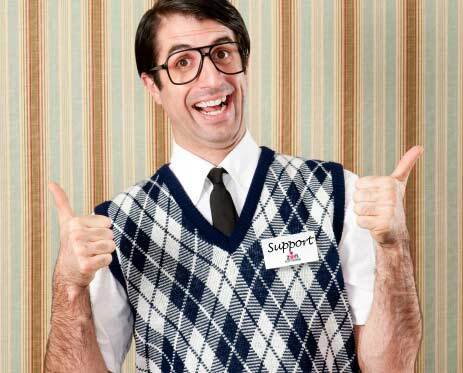 This allows Fred to change his password without the job needing to be updated. Under the folder selection section click on ‘add’ to select the folder to exclude, in this example I’ll choose the project folder under the inbox. 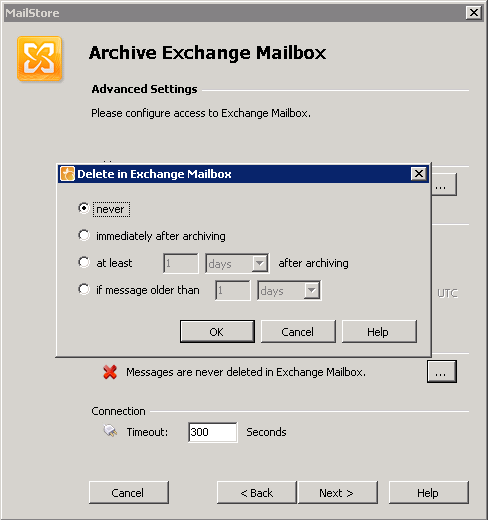 Next configure this job to delete all email older than 1 year. Click through to the end of the job wizard choosing Fred’s archive as the destination. 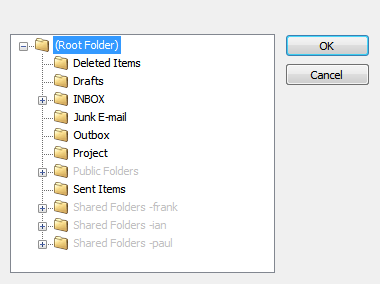 The last step is to create a third ‘Single mailbox’ job to specifically archive Fred’s project folder. The easiest way to do this is to create a copy of the previous single user job and change it as needed. To copy a job right-click on it and choose copy, then right-click again and choose paste. Edit this new job and under the inclusions/ exclusions section, remove the exclusions and add the project folder to the inclusions section. 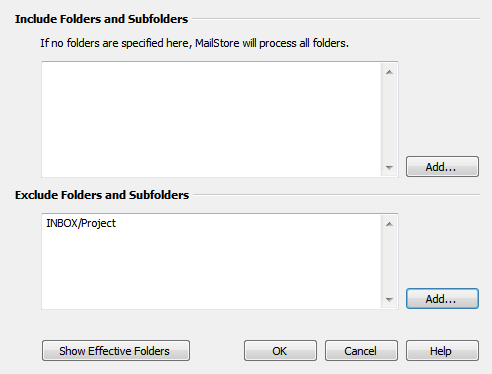 (This will instruct MailStore to only archive the specified folders for this job). Remove the option to delete any messages within this job. Continue to the end of the job and save it. The last step is to rename the jobs to make them a little easier to recognise. At this stage we can run these jobs manually by clicking on them and choosing the ‘run’ option but to automate the task we need to schedule them to run once a day. To set up a schedule, right-click on each job and select ‘schedule’. Choose a time of day to run the job, you can configure both jobs to run at the same time as there will be little overlap and MailStore is quite happy running several jobs at once. Hopefully that’s given you a feel for how with some simple exclusions and inclusions you can create some unique and powerful per user archiving rules in MailStore. As always, if you have any questions about this method or have some other different requirements please feel free to get in touch!